Today the Mount Pleasant Baptist Church of Norfolk, Virginia, an African American congregation, is officially founded, one of many black Baptist churches established this month. The church traces its origins to the antebellum period, during which time two slaves — Jacob Cargo and Elijah Lively — held prayers meetings in the Norfolk area. The Emancipation Proclamation of January 1, 1863 led to great rejoicing from the prayer group, and was celebrated in the home of Peter Catney. Now as freedmen, the members of the Mount Pleasant congregation look forward to a bright future. In due time the congregation builds their first building at the corner of Newport Avenue and Birmingham Avenue. 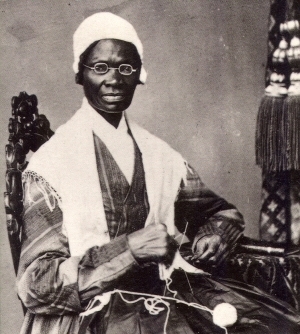 Also this day, Sojourner Truth writes to “Amy Post — My Dear Friend” from the capital of Washington, D.C.
As she notes, five months following the end of slavery in United States, African Americans yet face many challenges, even in the North. I have heard nothing from my children for a long time, neither from my grandchildren since they left me. I take this occasion to inquire after their whereabouts and health, as well as your own prosperity, and to inform you of my own. I spent over six months at Arlington Heights, called the Freedmen’s village, and served there as Councilor for my people acceptably to the good but not at all times to those who desire nothing higher than the lowest and the vilest of habits. For you know I must be faithful Sojourner everywhere. I have generally received the kindest attention from those in Authority, even to the President. But I see dark spots still in the great cloud that leads us by day, and occasional angry flashes in the pillar of fire that guides through this long dark night. Yet my comfort in all this is in the thought that God rules. A few weeks ago I was in company with my friend Josephine S. Griffing, when the Conductor of a street car refused to stop his car for me, although closely following Josephine and holding on to the iron rail they dragged me a number of yards before she succeeded in stopping them. She reported the conductor to the president of the City Railway who dismissed him at once, and told me to take the number of the car, wherever I was mistreated by a conductor or driver, and report to him and they should be dismissed. On the 13th I had occasion to go for blackbury wine, and other necessities for the patients in the Freedmen’s Hospitals in the City where I have been doing, and advising, for a number of months under sanction of the Bureau. As they had often refused to stop for me, I thought now I would get a ride without trouble as I was in company with another Friend Laura S. Haviland of Michigan. As I ascended the platform of the car, a man just leaving it, called out “Have you got room for niggers here!” as the conductor then noticed my black face, pushed me, saying “go back—get off here.” I told I was not going off, “then I’ll put you off” said he furiously, with clenching my right arm with both hands, using such violence that he seemed about to succeed, when Mrs. Haviland reached us and told him, he was not going to put me off, placing her hands on both of us. “Does she belong to you! If she does, take her in out the way” said he, in a hurried angry tone. She replied “She does not belong to me, but she belongs to Humanity and she would have been out of the way long ago, if you had have let her alone.”….